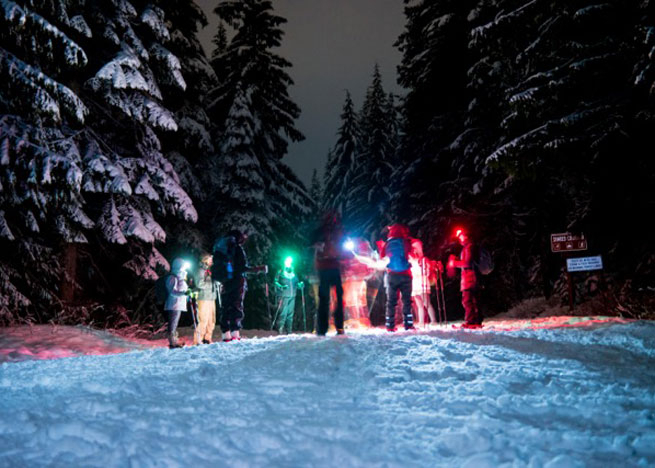 Join Next Adventure as we explore the Mount Hood National Forest by moonlight! Everything is different when you hike in the dark. Add snow to the mix and you get an exhilarating adventure that heightens the senses. Familiar trails become new again, bathed in moonlight reflected off the crisp white snow. Snowshoeing is a great way to explore the beautiful snow-covered landscapes of the Mt. Hood National Forest. And it’s easy! If you can walk, you can snowshoe. Let Next Adventure help you enjoy your time outside by providing the transportation, free gear rental, and instruction from an experienced guide. For more details and information visit Outdoor School Full Moon Snowshoe Tours.